to be, with the full seven round series completed without a race being lost to the weather. been sold by next year. Round five was again in the north, at the superb Wilberfoss track near York, where conditions were perfect. Then it was back to Hawkstone for the Festival of Legends two dayer, with the added bonus of a whole host of guests on the August Bank Holiday Monday, including Jack Burnicle, Roger Harvey, Neil Hudson, Bryan Goss, Andy Ainsworth, Rob Hooper, Pete Mathia and many more. The series finale was once again a two day affair at the fast and furious Pontrilas, in deepest Herefordshire, where all but one of the titles were won and lost. all his races to emphatically win the title, and become the new National Twinshock Champion for the Jem Parker and Robin Chadwick team. Another rider who improved at every round, was former GP star David Campbell, out on an Andy Cleaver Honda, and as well as finishing runner up in the class, also won the individual award at the VetsMXdN. Last year’s champion Lee Holland eventually battled his way back to third in the series, and another former champion Michael Smith took fourth on the Ken Sourbutts Maico, which could have been better but for some broken toes at the final Pontrilas round. Jonathan McBride crossed the Irish Sea for every round, and took a fine fifth place, in front of Jamie Biddulph in sixth, who also won the Falcon Shocks Best 250 rider. Simon Bentley, Luke Freudenau and Mark Gardner. It was nip and tuck at the top with only a few points separating the top four all year. It even went down to the final race of the season to sort out who was to become the champion, and it was a jubilant Cumbrian Mike Tucker who pipped runner up Gavin Cole to the title by a mere nine points. Simon Bentley, who had been running at the top of the leaderboard took third, with Welsh rider Mark Gardner in fourth. Lucy Tilzey took fifth, which was the best ever female finisher in the history of the series, from Luke Freudenau in sixth. The CI Sport Intermediate class, was initially led by James Graham on the 250 Honda, but injury at Hawkstone put paid to his title aspirations. From there on in it was James Curtis who took over the series lead, and he managed to get enough points on the board, and even though he dislocated his shoulder at Pontrilas, he had done enough to take the title, albeit from the hospital waiting room. Matt Bennett, who finished as last year’s Clubman runner up, showed a lot of fight and consistency to take a tremendous runner up in his first years with the Inters. Dom Bratt rode the big four stroke to third place, in front of Chris Anderton in fourth, who was the top Over 40 rider in the class. Fifth and sixth went to Sean Burrows on a four stroke Husky, and Daran Williams. In the MD Racing Over 50’s class, Irelands Willie Burgess on the Murphy Maico, won all but three races to take his first Twinshock title, with a round to spare. He led from the front, with his main challengers being Pete Mathia and Alan Bott. Eventually Bott came home second in the class, despite missing the opening round due to racing in the U.S. Tim Sabine had his best season ever on the big 500 Suzuki, and came home third, in front of former Haynes Champion, Jerseys Wayne Le Marquand on the Marsh HPF Honda four stroke. Pete Mathia was always up there, but missing two rounds did not help, and Chris Woodward took sixth. The Over 60’s always produces some good racing, and this season it continued with Graham Challis taking the first three rounds, and he never looked back. Having missed out in 2016, he took control and won his first title at the final round, with last year’s winner Alan Hambridge chasing him down to take the runner up spot. Martin Snape won three of the rounds to take third, which might have been better but for missing a round. Steve Mitton, Allan Williamson and Bill Brown completed the top six. The MRH Consultants 125 Twinshock boys raced alongside the 125 Evo class, and mixed it with the more modern bikes. Debutant Mark Burrows was the first to show, leading the series after two rounds, but was overhauled by reigning champion John Davis, who went onto win all but one race in the last six rounds to take his second title. Burrows came home a great second in the series, from Steve Riley, Tim Grindrod on the Moto Villa, Dave Ellis and Jason Herring. If you like to watch Evo racing at its best you need to see the 125 boys in this championship as it was truly outstanding, the pace these guys set. The two arch rivals, Jacob Joyce and Andy Lawton, riding the Steve Clitheroe Hondas were never more than a few yards apart all year, and each took it in turn to be out front. After five evenly split rounds, there was only 14 points separating them, but then at Hawkstone, Lawton had a machine problem that meant he missed two races and the chase was all but over. Joyce took the points needed at the final round, to take his first Evo title from Lawton in second. The other riders in this class always made a race of it, and it was Jonno White on the Suzuki who came in third, from John Butler, David Blackburn and Jason Slater. 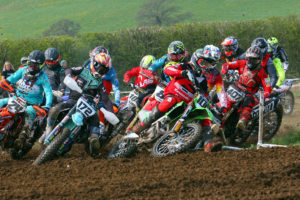 In the Woodys Vintage Off Road Honda Evo Open class, the racing was just as hot with a host of former British Championship and AMCA champions. It turned out to be a straight scrap between David Campbell and Jamie Dobson though as both riders took round wins. And although Dobson took three wins to Campbells two, it was the canny Scot Campbell who took the title in the final race of the season winning the title by just six points. Third place went to former champion Michael Smith, who just edged out Danny Blakely who had to miss round six. Fifth went to Andy Hichliffe, who was also the best 250 rider, and sixth was Michael Ogden. The Hazport Vets class for riders Over 40 on modern bikes, was won by Yorkshires Danny Blakeley, who had a season to remember as he won all but two races on his way to the title. He even rode his Evo Kawasaki to victory in a few of the rounds. His nearest challenger was last year’s champion Jonno White on the Suzuki, who took the runner up berth from Paul Groom. Mike Allport took fourth, and was also the best Over 50 rider. Dave Bennett and Steve Sharples completed the top six. Chris Rowlands and Mark Bowden were the other top over 50 riders. Our thanks go to series sponsors Toughsheet, Rider of the Meeting sponsors Martindales, all our class and event sponsors and all who helped make this series what it is.